A pan 8” or so in diameter, not much broader. 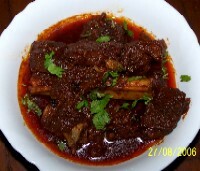 Marinate meat in lassan, salt and laal mirch paste for 3-4 hours. Heat the ghee in a pan and add the laung, elaichi, dal chini and kali mirch. Stir once then add the meat mixture over high heat. Saute till opaque, then lower the heat and cook covered at the lowest heat till tender and fat separates.